Wimmer et al. reanalyze and reinterpret a classic dataset of neural recordings from MT while monkeys perform a motion discrimination task. The classic result shows that the firing rates of neurons in MT are correlated with the monkey’s choice, even when the stimulus is the same. This covariation of neural activity and choice, termed choice probability, could indicate sensory variability causing behavioral variability or it could result from top-down signals that reflect the monkey’s choice. To investigate the source of choice probabilities, the authors use a two-stage, hierarchical network model of integrate and fire neurons tuned to mimic the dynamics of MT and LIP neurons and compare the model to what they find in the data. The figure above shows the two stages. They key manipulation the authors employ is to change the amount of feedback from the integration stage to the sensory stage. 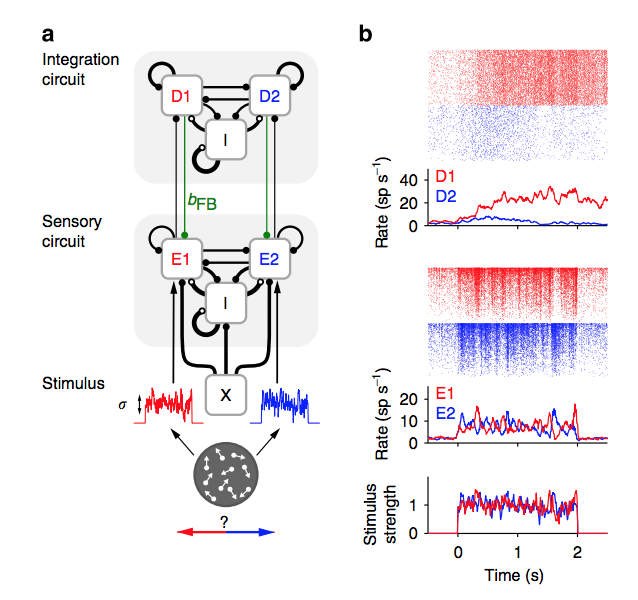 In their model, variability in the sensory stage can arise from 3 possible sources: 1, stimulus variability (red and blue squiggles that lead to E1 and E2 populations); 2, background noise (X); and 3, feedback signals (green bFB). They find that changing the amount of feedback in this type of network makes several predictions that can be tested using existing data. They argue that feedback signals should account for choice probability (CP) later in the trial, which means the early part should be due to feedforward fluctuations in the stimulus. This allows them to take advantage of a stimulus manipulation in the data: some of the trials are perfect repeats of the same stimulus where as others have the same motion strength but are generated using different random seeds. They call these two conditions replicate and non-replicate, respectively. The model predicts that CP will be smaller for replicate trials during the early part of the motion stimulus because there are no stimulus fluctuations. 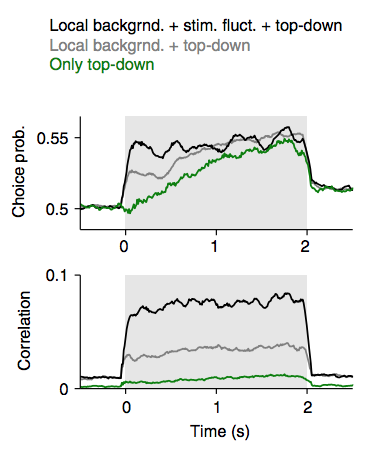 The model also predicts that correlations between cell pairs will be smaller across the board for replicate stimuli (see the comparison between the black and gray traces in both subplots below). The authors find that both of their predictions are true in the data they have access to. They analyze CP across 41 neurons with replicate stimuli an 118 neurons with non-replicate stimuli and look at correlations across 32 pairs. 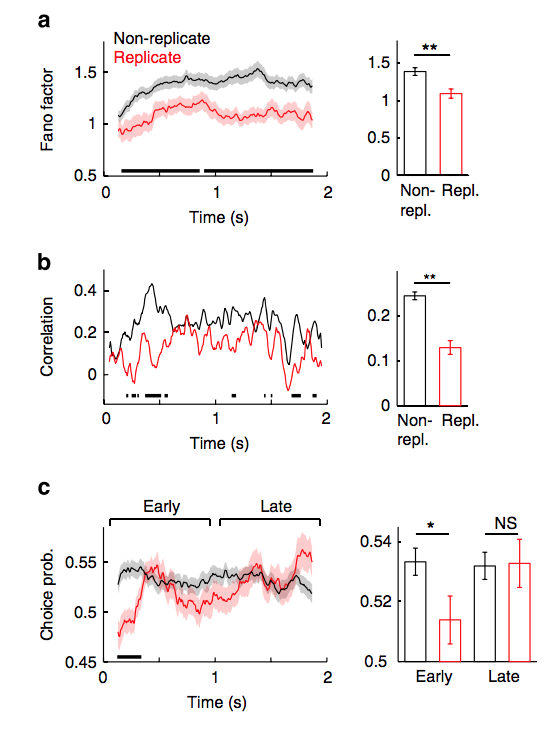 They find that neurons were less variable with replicate stimuli (subpanel a below), that correlations in an example cell pair were smaller for replicate stimuli, and choice probability was lower earlier in the trial for replicate stimuli. They also interrogated cell pairs to see if noise correlations were indicative of a feedback signal. They sub-selected pairs based on whether they had increasing or decreasing correlations through out the trial. The prediction is that increasing correlations means more feedback, so these cells should have higher CP later in the trial, which is exactly what they found. The authors end by suggesting that the feedback could serve to strengthen the commitment to a category despite bursts of sensory evidence. Unfortunately, this makes the simulated observer less sensitive. Overall, the paper is a valiant attempt at understanding the source of choice probabilities using decades old data. The insights remain clear: the time-course of CP and noise correlations should be informative about top-down signals during decision-making. Hopefully new data will be available soon to help constrain the space of models. This entry was posted in Uncategorized by jlyates. Bookmark the permalink.